Italy has a rich cultural history and entrepreneurial heritage, so it is also a great place for innovation and start-ups. 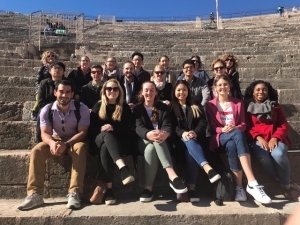 The IB495 class at the University of Alabama at Birmingham’s Collat School of Business spent one week in Italy exploring Bologna, Sant’Agata, Verona, Grezzana, and Milan. 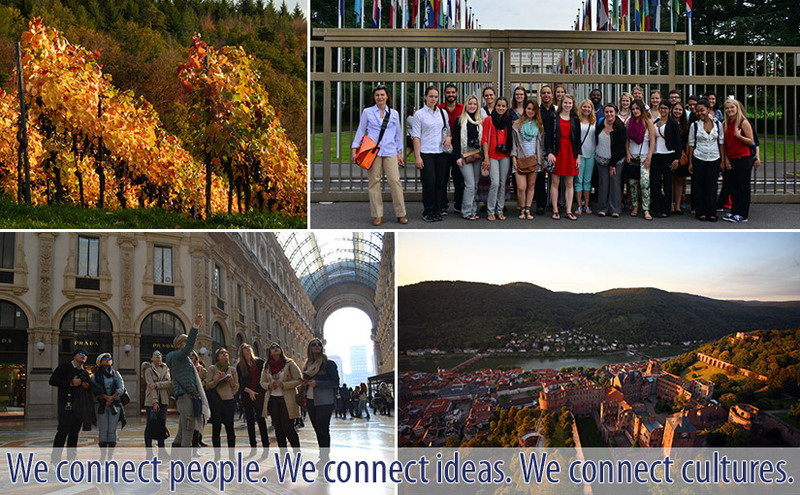 The study abroad program focussed on the evaluation of the environment for innovations and entrepreneurs. It provided an insight into the culture, history, and economy of Italy. 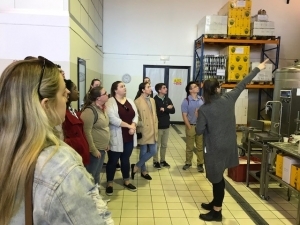 During multiple visits to businesses from the automotive, financial, architectural, as well as the food and agricultural sector students gained a stronger awareness and better understanding of Italy’s business climate and the resaons why Italy continues to be a great destination for innovation and entrepreneurship. Thinking about taking your classroom to Italy? The team at CEPA is full of ideas to make your Italian experience unforgettable. Start planning your program with us. This June we are proud to celebrate the arrival of a group from Davenport University as our 100th study abroad group for 2017 with many more to come. We are happy to share this special moment with them. The group arrived on June 3rd in Milan with 14 students and their faculty leaders. 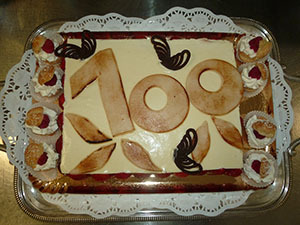 They were greeted with a “100th group” cake as a small surprise by their CEPA on-site coordinator, Morena. During their “European Business and Culture Program” the group explores the heart of Europe by visiting 6 countries in 3 weeks. The program includes corporate visits to companies and institutions, such as Ducati Motorcycles in Bologna, a Swiss bank in Zurich, the European Parliament in Strasbourg as well as a broad range of cultural excursions. We are proud to mention that Davenport University and CEPA have been running business programs throughout Europe for 10 years now and that we are honored to have this long-standing relationship with our partners at Davenport University. Deciding on the dates for a faculty-led program in Europe can be a very difficult if not the most challenging decision of the development process. There is definitely no “one size fits all” and academic, financial, and cultural factors must all be considered. Autumn in Europe can be just beautiful! It may not be beach weather, but it’s pretty much perfect for a cultural visit. In late-September the crowds start to thin out. It is much easier to appreciate a city’s attractions and to soak-in the local way of life. There are many small cultural and historic festivals dedicated to local history, music, art, handicrafts, food, and traditions. Attending such an event is a great opportunity to meet locals, interact with them, and learn more about their culture. By the end of August, Fall pricing begins and fares drop for the less expensive season. Send us an email to info@cepa-abroad.org or visit our website to request a custom proposal. Celebrations are in order for a group of 12 study abroad students and their faculty leader from the University of Florida. We are proud to share this event with them. 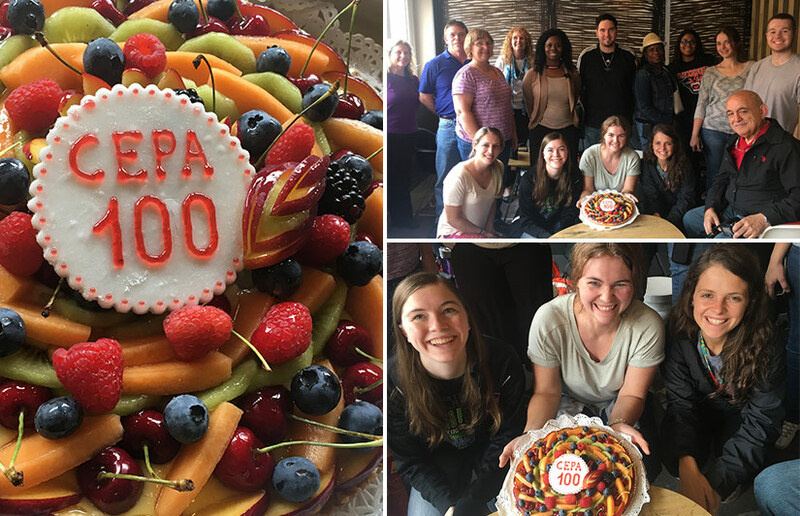 This June marks a milestone for CEPA, welcoming our 100th study abroad group so far for the year. Approximately 35 more faculty-led programs from different universities will take place throughout Europe, Asia, and Brazil this Fall and by the end of 2016. 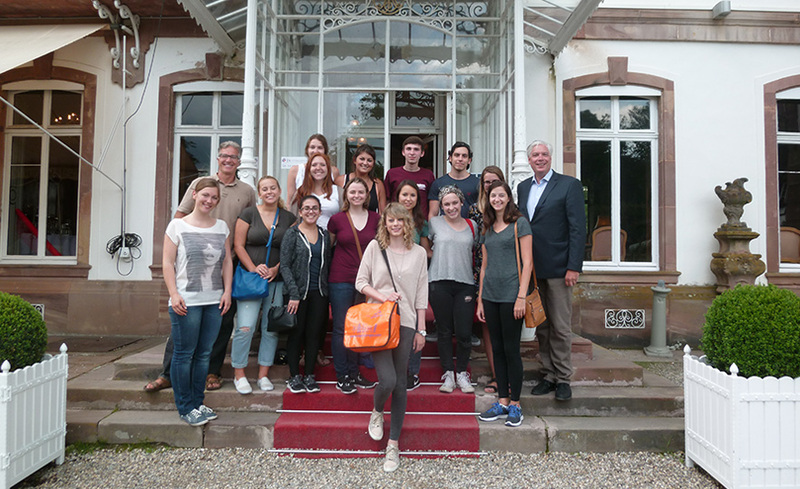 During their stay at the European Study Center in Strasbourg – Château de Pourtalés, the student group from Florida were honored during an afternoon cake and coffee party by Harald Leibrecht and the team members from CEPA and the Château. The students are staying in Europe until the end of the month, taking part in a full-spectrum program organized by CEPA. It focuses on comparative environmental politics and sustainability including visits to the European Parliament in Strasbourg, United Nations and World Trade Organization in Geneva, many castles, wineries, and organic farms in France and Germany, windfarms and solar power industries, local and organic food production, as well as cooking schools in Italy. As part of their course requirements, the University of Florida students will be developing projects for “bringing home” to their own towns, cities, and states the best environmental and sustainability practices and policies observed and studied in Switzerland, Germany, France, and Italy. 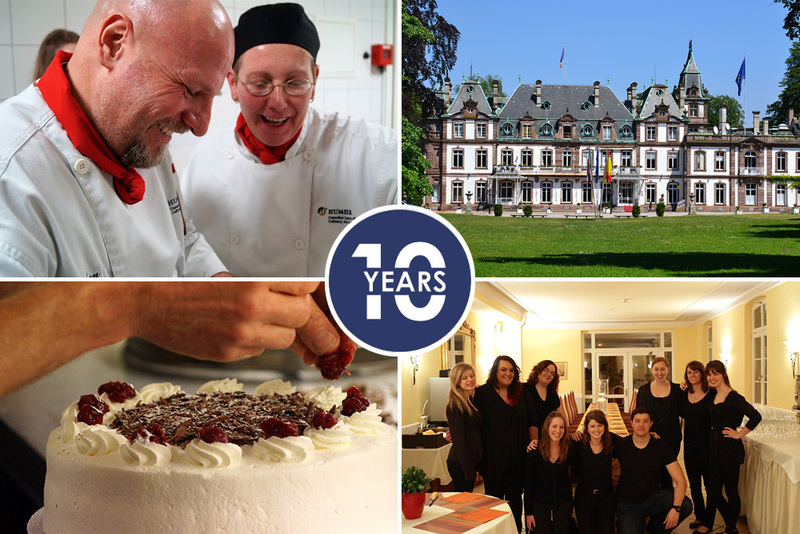 For 10 years, Humber College (School of Hospitality, Recreation and Tourism) and CEPA Europe have been running a semester abroad program in Strasbourg, France open to students with a major/minor in Culinary Management, Hospitality Management, Tourism Management, and Tourism & Hospitality Management. During the program students reside at the historic Chateau de Portales and complete seven weeks of classroom instruction. 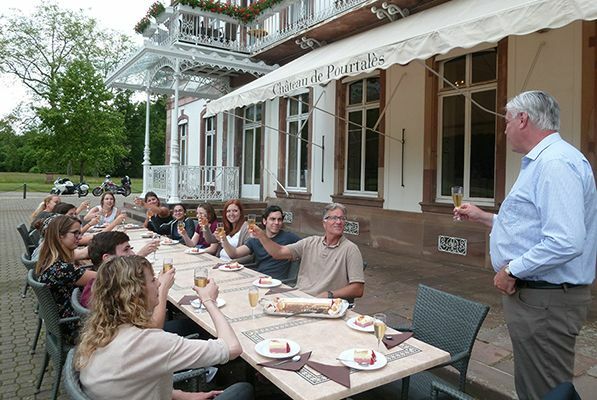 Weekly field trips are taken to breweries, wineries, patisseries, hotels and attractions around France, including Paris. After 10 years, we feel very honored to have this relationship with the people at Humber College. 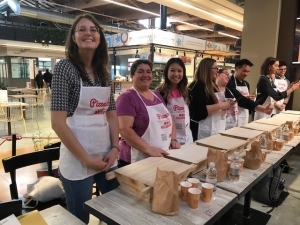 Together, we work hard to continously improve the program in order to make it an excellent opportunity for their students to connect their classroom learning with real-world experience. 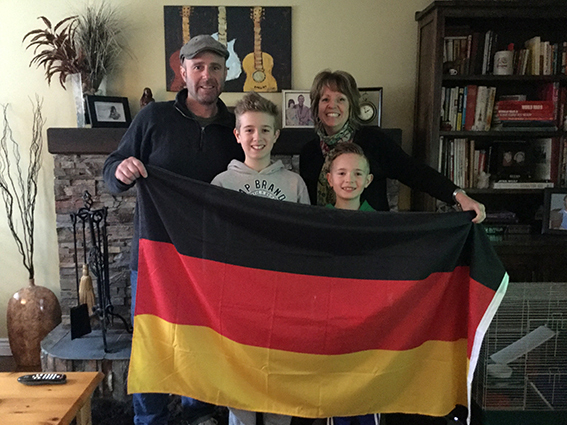 “The experience and CEPA changed our lives! That’s the truth. Our family will always have the unbelievable memories to hold onto for the rest of our lives. We are so incredibly thankful for the opportunity to experience Europe. I truly cannot think of a day that goes by where our trip doesn’t touch us in some way. Whether we are looking at some of the artwork we brought back or singing our own kugelhopf song or Skyping Biggi or looking at our photos, smiles our brought to our faces each and every time. Thank you Uli for all that you and your team provide to EVERYONE who graces the Chateau’s doors and CEPA’s programs.